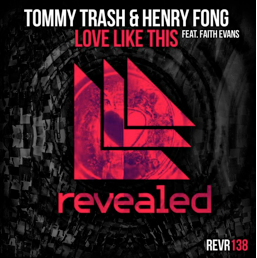 As a label synonymous with delivering big tracks, ‘Love Like This’ from Tommy Trash & Henry Fong featuring Faith Evans, is already proving a stand-out release on the Revealed Roster for 2014. Australian Tommy Trash is no stranger to the industry, with both Grammy and VMA nominations for his productions under his belt, Trash now joins the label for the ‘Love Like This’. Joining Tommy is Henry Fong, a Revealed artist making his comeback after 2013’s ‘Get Down’. 2014 has been a big year for Henry with appearances at top festivals and a variety of releases. Now, Trash and Fong join forces for the first time having just concluded Tommy's sold out Trashed North America tour together. Enlisting R&B vocalist Faith Evans to add a modern twist on her original take of the 1998 classic, Tommy and Henry’s version bounces back beats with a force across Evans’s melodic vocal. Premiered by label boss Hardwell during his Ultra Japan set this year, ‘Love Like This’ is a modern take on a cross-genre classic, and should do well for the label over the winter months.